Following broad weakness in the luxury environment — likely triggered by China's political leadership change at the end of 2012 and structural industry changes — demand trends have started to improve since end-2016. Luxury demand has effectively picked up on the back of synchronized global GDP growth in the luxury sector's key markets — China, Europe and Japan in particular. Notable exceptions to this recovery cycle are the US (where luxury demand remains subdued and volatile), the Middle East (oil price volatility, geopolitical tensions) and South Korea (geopolitical tensions impact local demand and duty free business). All in all, evidence of cyclical demand recovery and the associated improved earnings momentum have driven a sector re-rating in the past 12-18 months, and largely explain why for the second consecutive year the luxury sector (+34% in 2017 to mid-December) has outperformed the European market (Eurostoxx +9%) and the World Consumer Discretionary Index (+21%). 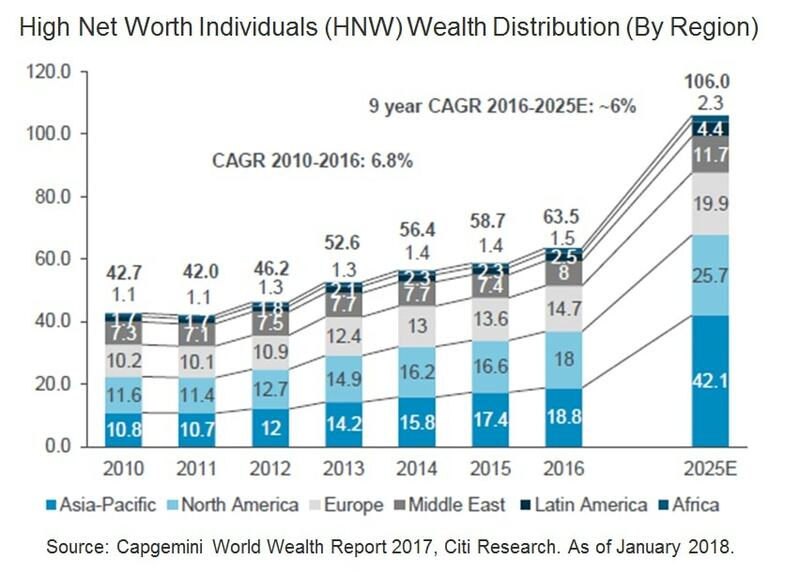 High Net Worth Individuals (HNW) Wealth Distribution (By Region) The luxury sector has re-rated significantly, leading to questions around whether valuations are stretched. At ~22x 2018E Price-to-Earnings (P/E), 15% over historical average valuation of ~19x, valuations appears stretched. On a relative basis, however, the sector trades on a P/E of 145 more or less in line with the historical relative P/E valuation of 140-145. Citi analysts expect sales growth to moderate to 6% in 2018E and 7% in 2019E, a healthy normalization from exceptionally strong growth of 10% recorded in 2017E. Key risks include a slowdown in Chinese demand (which contributed 65-70% of industry growth in 2017 and is expected to contribute 55-60% of growth in 2018). This could stem from geopolitical tensions rising in North Korea, pressure on Chinese credit markets, further terrorism in Europe and stronger euro/renminbi exchange rates. Stay tuned for more updates on the Luxury Sector at Market Insights by Citibank.